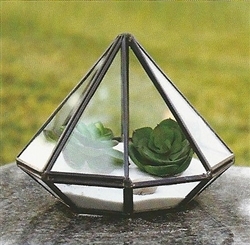 Glass diamond-faceted terrarium. 6" tall, 6" wide. These are nice quality, and look great! Black frame. Glass items may require additional shipping due to weight. Round Mirror, 6" (for undereath vases) Glass Cylinder Vase, 10" x 8" Glass Rectangular Vase, 8" x 3" Tapered Square Vase, 20" x 6"
Glass Rectangular Vase, 12" x 3" Glass Cylinder Tube/Hurricane Vase, 10 x 4 in. Glass Cylinder Vase, 8" x 3" Glass Cylinder Vase, 8" x 5"